There is not a zip line in Honolulu City yet. A plan is in place to to put a zipline in Waikiki, which is a neighborhood in Honolulu. Right now there is not a City of Honolulu zip line. Honolulu County makes up the entire island of Oahu. Therefore, there are currently three County of Honolulu zip lines. You can book those zip line tours with us. 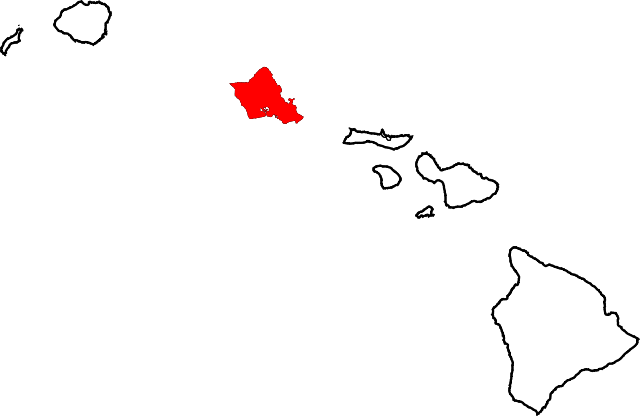 Honolulu County is the Island of Oahu. For accuracy sake we should mention that some private properties have private zip lines. You might see photos or videos online of people riding these zip lines. We discourage the use of private zip lines in most cases for safety reasons. The number of Honolulu zip lines is expected to grow with the Waikiki Zip line at the Hilton Hawaiian Village and with Coral Crater Adventure Park. As the industry changes you will know where to get the most updated information. Right here on OahuZipline.com, the authority on Honolulu Zip Lines. What if my child is underweight. Can we ride tandem? All Oahu Ziplines require you to sign a liability waiver to participate. In fact, nearly every outdoor activity that you participate in while visiting Oahu requires a liability waiver. Refusal to sign the waiver is not grounds for a refund. Children under 18 are required to obtain permission from a parent or guardian, who is authorized to sign a waiver on their behalf. Am I big enough to zipline? OR Am I too big? Not all ziplines have the same rules for size. They use different harnesses and have different policies. In addition to size and weight requirements, ziplines have age requirements. The minimum age requirement varies by zipline. The Minimum age to zipline is 6 years old. The Minimum age to zipline is 7 years old. To do the zipline tour at Kualoa you should be 7 years old. 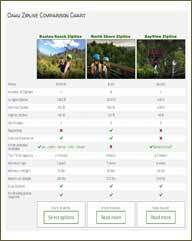 More important than the age to zipline is the weight and size requirements above. Can I watch my kids zipline without participating? At Bayview Zipline you can watch others enjoy the zipline. At Kualoa Ranch and the North Shore Zipline at Keana Farms you cannot be a spectator. It is best to join the tour or hear about it afterwards. Ziplining is an all weather activity. In fact some people prefer it in the rain because it can add speed. Wind is not a friend of ziplines because it can cause deceleration if it is blowing against you. The Oahu Ziplines are very careful to cancel if the weather is too bad to zipline. If you have booked with us and the weather is so bad that your tour is canceled, you will get a call advising you not to go. If we cancel for weather related reasons, we will provide a full refund. If you show up to the North Shore Zipline or Kualoa Ranch without reservations, you will be very unlikely to get a tour. As of this writing, the tours are selling out 5 – 10 days in advance. Showing up will mostly likely lead to disappointment. We also recommend that you make a reservation for BayView Zipline because there may be a large birthday party or other group there at the time you want to go and you will have to wait. It is better to make a reservation and cut down on your wait time. Yes. Oahu Ziplines are safe. Are you Afraid to Zipline?